Sometimes the internet gives great advice. Who said you can't trust everything that you find on the internet? Well, ok, the majority of the stuff that you find online is crap. But every once in a while you come across something that truly resonates with you. It could be a quote, an article about two celebrities who's marriage you squeed over (Hello, Blair Waldorf and Seth Cohen), or a great cause that you support. For me, it was this image. The glitter is what caught my eye, but it was the message that made me save it. 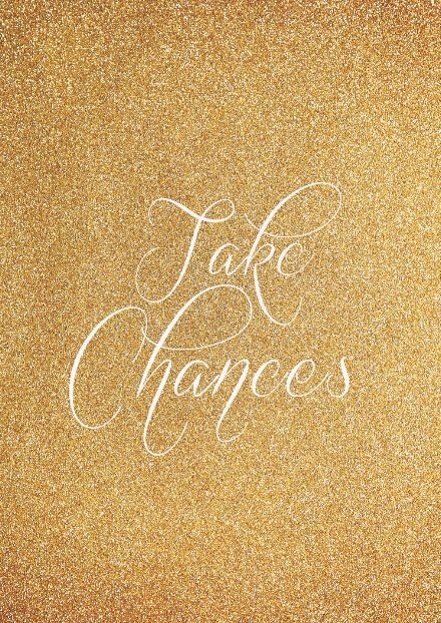 Too often, I shy away from chances because I'm afraid. Afraid of rejection, ridicule, or failure. Sometimes, though, you can't sit back and take the easy path. Sometimes you have to put yourself out there, ready to accept failure or celebrate success. Of Course I Bought a Juicer!